Everything old is new again in TV-land! Ah, if I only had a buck for *everytime* that I said that! As you know, I've been complaining at great length about the 'return' of several show franchises from the 80s and 90s...but I'm not all gloom and doom -- some of the re-vitalized programs I actually like! 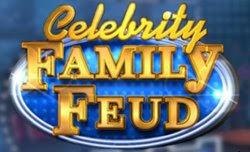 Take the reappearance of 'Family Feud' -- but in the more fresh celebrity themed edition. Hosted by NBC's Today Show weather dude, Al Roker, this star-tinged reproduction is funny, offers the same silly style of quiz questions from yesteryear and even goes as far to include 'TV families' -- like the crew from 'The Office' and 'My Name is Earl' all in character, doing their thang! LOVE IT! Also enjoying a boomerang effect -- fellow game shows, 'Password' and the soon to be in production, 'The Dating Game' and 'Newlywed Game.' Now if only they'd bring back 'Concentration' and heck, even 'Press Your Luck' (no whammies!!!) -- the world would be a happier place!